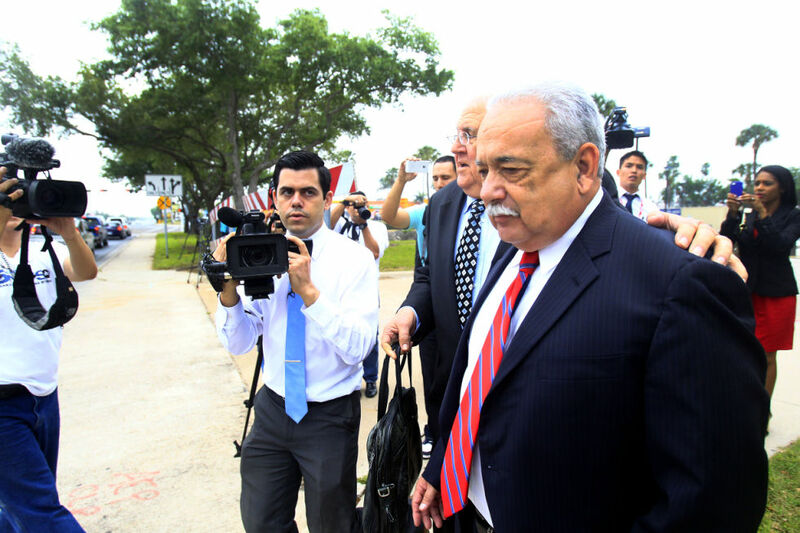 Former Hidalgo County Sheriff Lupe Treviño walks past the media with his attorney Robert Yzaguirre after leaving federal court on Monday, April 14, 2014 at the Bentsen Tower in McAllen. Treviño pleaded guilty to federal charges of money laundering. Treviño was released from prison today. Former Hidalgo County Sheriff Guadalupe “Lupe” Treviño has been released from a federal prison, six months before his five-year sentence on federal bribery charges is scheduled to end. Treviño was being held at the federal prison camp in Pensacola, described as a minimum security facility by the U.S. Bureau of Prisons (BOP), and is now under the custody of its Residential Reentry Management Houston field office located in San Antonio — which oversees inmates at halfway houses, in local jails or on home confinement across Texas. An RRM Houston spokeswoman said BOP would not disclose Treviño’s physical location, noting he “would be the only one” able to provide such information. The 68-year-old entered BOP custody in 2014 after pleading guilty to a conspiracy to launder money charge in McAllen’s federal court. His release date from BOP custody remains Jan. 15, 2019. The former sheriff accepted campaign contributions and other money from convicted drug trafficker Tomas “El Gallo” Gonzalez during Treviño’s 2012 re-election campaign. The amount Treviño accepted remains unclear, but the presentence investigation report U.S. District Judge Micaela Alvarez used to assess his punishment estimated it to be approximately $25,000, while federal prosecutors put the figure between $70,000 and $120,000, according to Monitor archives.